I've gotten a little stir crazy being in my house so long and I've also been tired of sitting on my phone and computer so long, so I decided to actually do something with all those pins on my crafts board! After merging several ideas, I made my Lilly monogram! This really didn't take that long to make, but it did take a little bit of planning out. 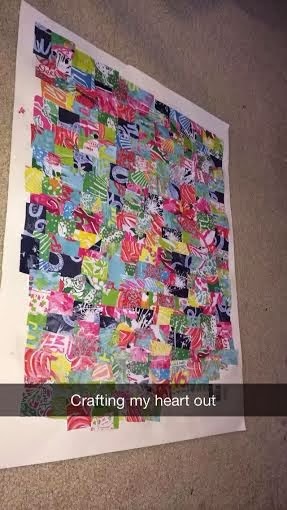 I cringe every time I see a craft about tearing the pages out of your Lilly agenda... like I paid SO much for that and even if it's old, I couldn't imagine tearing apart such a beautiful thing! 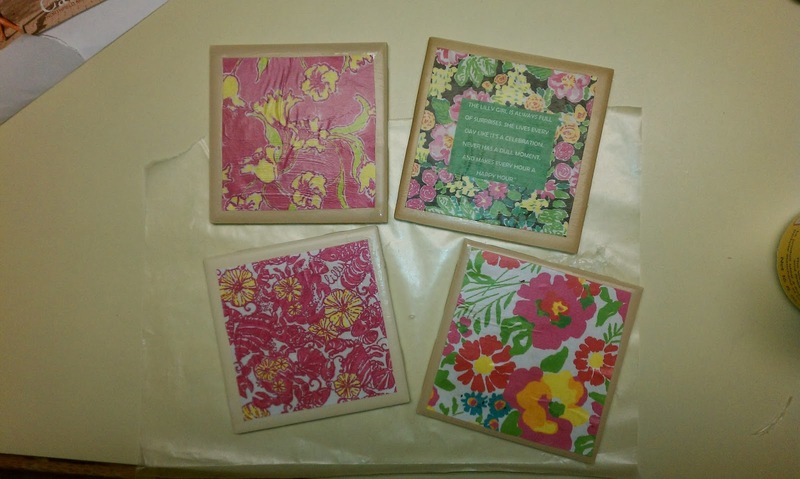 If you're feeling the same way, my solution is to print out Lilly prints on paper-- easily the exact same thing. 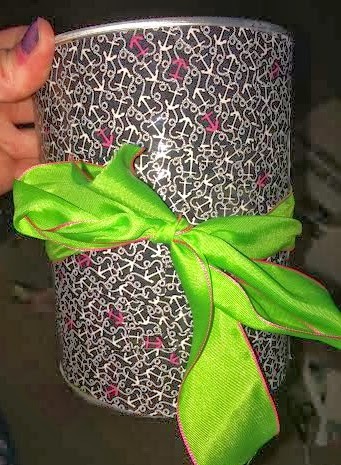 It's how I made my Lilly coasters and pencil can! The next thing I got was an old poster board. I'm not kidding, this is one of my old volleyball posters that I had made and knew I could use it for something some day (#craftinghoarder), and you really don't need it to look pretty. 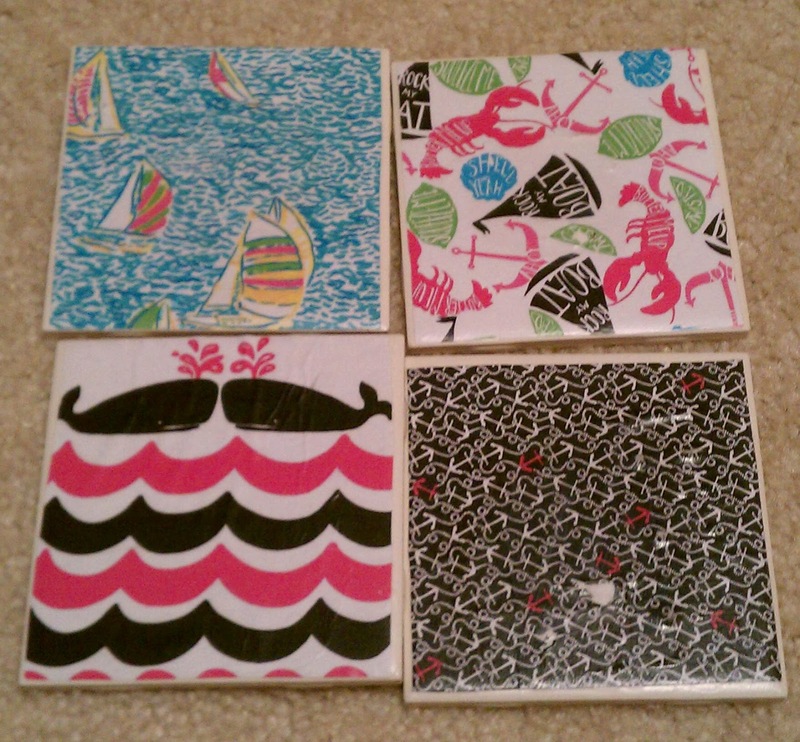 And of course, the necessity: Mod Podge. I've seen all the crafts about it, but never really knew which parts of the agenda they used. So I went through and ripped out (*shudders*) the month pages, mostly just the pages with the prints where they said the month's name. The ones with the cute little quotes-- I didn't use those only because they were cute and didn't have many prints. But I did save them because I think it could be such a cute alternative craft in the future! I went through and stacked up the printed ones and cut them into strips and then into squares, making sure to get rid of the perforated edges before. It really helped that I stacked them and then cut them so they mixed well. I used my lap board (thank you, Michaels!) to keep the pieces on and just put the poster board on my floor. I'm telling you this and I'm going to tell you all of these odd details because I know that when I read DIY guides, I need these for logistics. It's easy to go, just Mod Podge it! and still be frustrated why there are differences in peoples' crafts. I just went through and started Mod Podging, though! It's important to know that not all of the pieces have to be the same size and it doesn't have to be perfect patchwork. The only rules I really had were minimal white space and trying to keep similar prints apart from each other. That's why it was helpful that they were already mixed up-- when your Mod Podge is wet, you need to go ahead and just start putting stuff down. Don't worry too much if there's a spot or two missing or if there are are inconsistencies. At the end of the day, it's going to be in a weird shape, so you'll barely notice it. I used just a normal paint brush and dipped it in the bottle, then went on top of the poster board, a few sections at a time. I was so fortunate to have such a cute little helper! Make sure that when you're doing it, you're going back over it again with the brush. That seals it and keeps it a little bit more pushed down. And trust me, it'll scare you to see all that white, but I promise, it dries clear. And of course, this is the point where you have to add it to your Snapchat story and drool over all of the Lilly. It was so pretty and my sister had thought I was just going to leave it like that and frame it, and heck, it's not a bad idea. This is where the semi-challenging part comes, but you've just gotta be calm. I've doodled my little heart out in AP Spanish with my monogram... my teacher will attest that it's one of my finer skills, rather than my fine Spanish speaking skills. But monogram after monogram, I'd have to say that I'm pretty okay at drawing circle monograms now. And I'll tell you that it IS one of the most important skills a girl can have-- put it on your resume and you've got the job in no time. But really, the biggest challenge with this is drawing your monogram backwards. What you're going to do is flip the poster board over, draw a circle as large as you want your letters, and begin. You can try to think of it and do it, or it may be easier to print your monogram out and flip it over so you can draw it backwards. I'd suggest doing it as normal on the front, but it's really difficult to see that way. After it's drawn, simply cut them out, ensuring that you're giving enough space for each letter. Much better for it to be too large and you have to trim it than tiny and you have wasted all that time. Oh.... sorry, I love my Devils, but I really love crafting as well. You can't see it, but I had drawn my letters and begun to cut them out. After the first letter was cut out. I was SO EXCITED. This was something I had come up with and wasn't really sure how it'd turn out and I still lived with that fear of me wasting an entire agenda, but it was just... pretty! Be sure, too, that you're keeping your scissors very wide and going slowly. Some pieces may not be completely glued down and you don't want to rip any. After you have your letters, feel free to do any thing with them! I have a lot of free hanging letters on my wall, so I decided to glue them onto another piece of poster board, add a bow, and hang it up! I can't wait to show you my wall of pretty things that I Instagrammed the other day! How do you not love your (monogrammed) letters in Lilly? I think it was really fun using the planner as well because you could see the months clearly, which was originally something I didn't want seen, but now I love. It kind of feels like I took my year last year and was able to condense it into what my last year was, ya know? Being sentimental about crafts is my specialty. Such a cute DIY! I'll have to try this! That really is the cutest thing ever!! I'll have to find an equivalent to Lilly Pulitzer in the UK!